Okay, my cute adorable home has turned into a playground for Evie. Anyone else feel me? Prior to having a baby my home was always perfectly organized-very minimalistic, and I loved it! Well, this is my new life; swings, jolly-jumpers, play mats and toys all over my living room. I am almost at a place where I have every “most recommended” toy/baby accessory that is available on the market. I’ve really enjoyed trying different products and sharing my honest reviews with you. I’ve received a lot of positive feedback that these have been helpful for expecting moms and moms who have been out of the game for a while. Today’s review is a MUST for all moms. Seriously, I would not be able to live without this product. It’s a Playtex Diaper Genie! Let’s be real, we change more diapers than we ever imagined and they STINK. 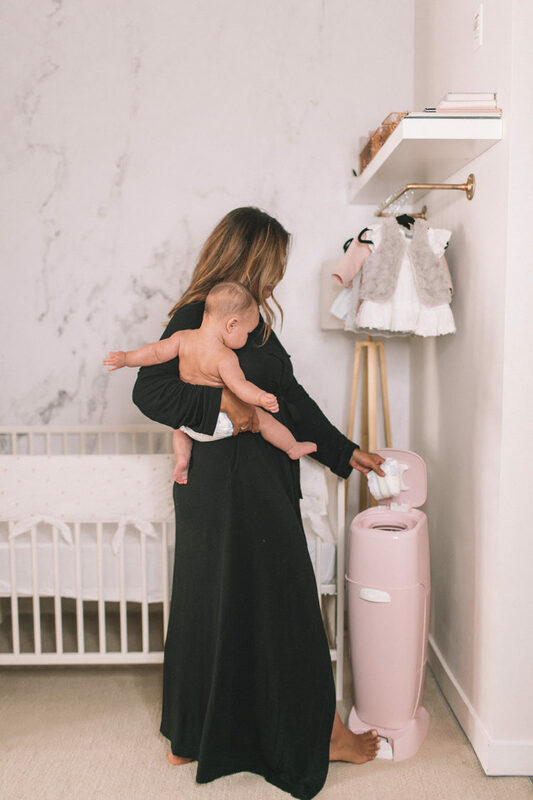 The diaper genie traps the smell so your home doesn’t smell like one giant diaper! It has a double-lock design and a 7-layer bag that makes sure the odors don’t escape. The filters are made with safe, natural activated carbon that locks in odour rather than masking it. I bought one for my home and eventually for my parents as well. I would feel so bad when Evangeline would have a dirty diaper and they had no where to put it. This makes for the perfect shower gift. They are so affordable (only $49.99 at Babies ‘R’ Us Canada) and essential for every home with a growing baby. Not to mention, they come in 4 different colors: pink, grey, blue and white (of course I got the pink), so it’s sure to fit in around the house. Hope you found this review helpful. Let me know if you’ve tried the Playtex Diaper Genie and what you think! You can purchase your Playtex Diaper Genie here.